SimpleCart is available exclusively from modmore at € 99 per license. Each license is valid for a single MODX installation. Standard support and lifetime updates are included in every purchase. 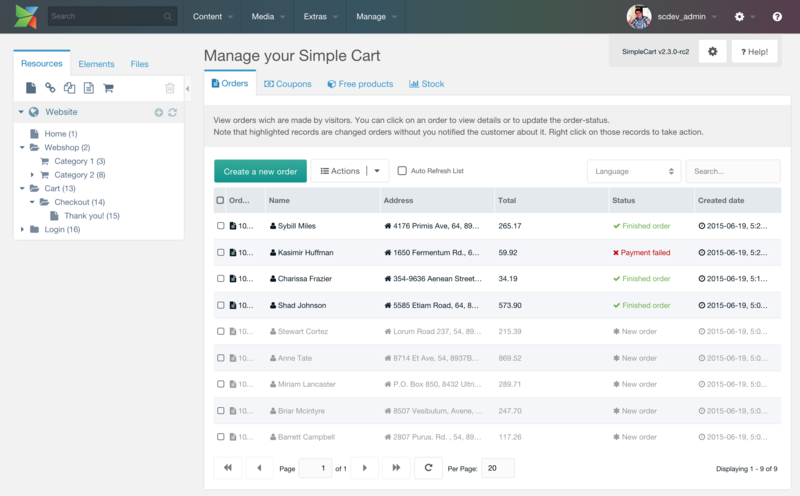 Can I try SimpleCart for free? Yes, you can use our free development licenses with SimpleCart to try it, or to start development before purchasing a license. With free development licenses, you can install this extra on domains that are on our whitelist, for example localhost, site.dev, dev.site.com. Standard support gives you access to our email support for as long as the major version you're using is supported. When a new major version comes out, you can choose to upgrade to renew your support and get new versions. We also offer a community forums for your questions and discussions about SimpleCart. In June 2015 we took over SimpleCart development from OostDesign. If you still have licenses from before that date, you can migrate them to our systems to upgrade to SimpleCart 2.3 and to receive continued support.